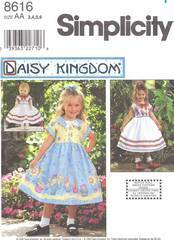 Child's dress and doll dress for 18" dolls such as American Girl. Dress has full skirt with attached slip and net ruffle. Raised waistline seam, back zipper, back tie ends and short kimono sleeves with cuffs. Includes Girls Sizes 3, 4, 5, 6. Chest 22, 23, 24, 25. Waist 20.5, 21, 21.5, 22. Complete and in factory folds. Copyright 1999.